I read this book after a recommendation from Amy on my post on African Fiction and Interracial Love/Relationships. Luckily, I found a copy on my sister's shelf, so I curled up on the sofa, as NEPA (sorry PHCN) was doing its usual not giving any power/light and decided to read In Dependence. In Dependence tells the story of Tayo Ajayi, a Nigerian man who gets a scholarship to study at Oxford in the 1960s, and Vanessa Richardson, the daughter of an ex-colonial officer. While it is a story of their love which spans from 1963 to 1998, it's way more than that. It's also a story about Nigeria, its independence and the changes that occur in the country post-independence - the Biafran war, the first coup and the numerous countercoups, military dictatorships, the brief return to civilian rule, exile of Nigerians, and towards the end of the book the eventual return to democracy. There are also issues of race, racism and cultural differences. We see Tayo, Vanessa, as well as a host of other characters, live their lives amidst all these issues. Tayo is an intelligent man but he always seems to do wrong. He tries to do the right thing, never wants to hurt anyone but in the end he does, especially the women in his life - and there are quite a number of women in his life that he hurts. Vanessa, on the other hand, dreams of being a journalist writing on African issues, marrying Tayo and moving with him to Nigeria to start a new life. Unfortunately life gets in the way and a host of things prevent most of her dreams from coming true. She does end up living one of her dreams - being a world renowned journalist on African issues. Tayo and Vanessa end up living their lives independent of each other but no matter what they did, and where they were, the thoughts and love they had for each other lingered on (even though the other didn't necessarily know). I guess love really does stand the test of time. A side note, or more of an observation. This is the second novel about interracial love/relationships that I have read that spans decades and is divided into parts - the other was The Boy Next Door. I guess it's an interesting way to show the trajectory of people's love. I don't know! What I do know is that this was a beautiful read and one I would definitely recommend. I'm so glad to see that you enjoyed this one as well! Yes,it was truly a good read and to me,it was the first interracial novel that I have ever encountered.I will try and get ‘The Boy Next Door‘..and I hope to be satisfactorily entertained..informed as In Dependence does to me. 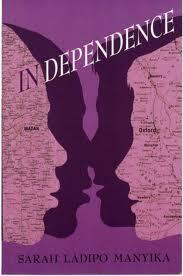 Hi Adedoyin, "In Dependence" really was a wonderful novel. "The Boy Next Door" is also a good read. Although I would have to say that it took me a while to really get into and start enjoying "The Boy Next Door", but once I did it I really enjoyed it.